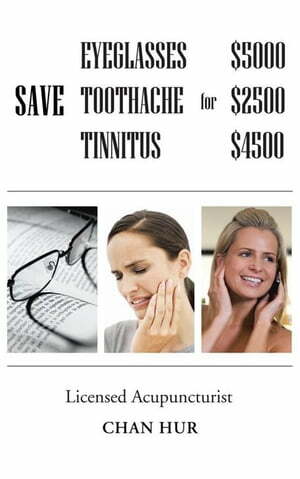 Collins Booksellers - Save $5000 for Glasses, $2500 for Toothache, and $4500 for Tinnitus by Chan Hur, 9781477217641. Buy this book online. Everyone get older. No question about it. Eye vision also gets dimmer. Most of us use eyeglasses or contact lenses when they get older. Some does a surgery of cataract or glaucoma. Can we avoid or prevent it? It is somewhat possible through this book. I have not worn glasses for at least 14 years by practicing exercises listed in this book. Additional benefits Inconvenience of wearing glasses Digestion improvement Rhinitis Allergy Gum disease Tinnitus Difficult hearing Headache Wrinkle removal Dementia This book explains how to do exercise without more time consuming, and recommends good foods and teas for eyes. There are some ideas most dont know or understand such as the danger of dental implants and how to treat difficult hearing or tinnitus.